1916 coins to feature Hibernia statue and key Proclamation words. Two coins commemorating Easter Rising designed by Emmet Mullins and Michael Guilfoyle. 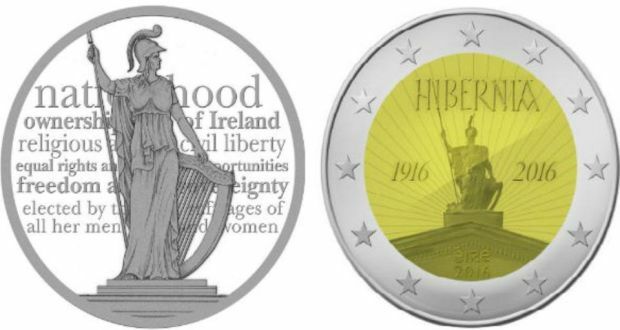 The statue of Hibernia and key words from the Proclamation of the Irish Republic will feature on two special coins commemorating the centenary of the Easter Rising, following a competition launched by the Central Bank. Hibernia, the historic personification of Ireland represented by a statue on top of Dublin’s GPO, the focal point of the Rising, will appear on 4.5 million € 2 coins that will feed into general distribution from January. Designed by the illustrator Emmet Mullins, it will also be included in a proof set and an annual mint set. As well as the representation of Hibernia, it features the name in hand-rendered lettering influenced by the Book of Kells, as well as the centenary dates. The second design also features Hibernia but includes key words from the Proclamation, read by Patrick Pearse outside the GPO on April 24th, 1916. This coin was designed by Michael Guilfoyle and will feature on proof solid silver and 24 carat gold versions which will be available from March. No price for these special versions has yet been set. Proof coins are produced in a high quality minting process specifically for collectors. It comes with a numbered certificate of authenticity. Mint coins are specially packaged and do not enter general circulation. The Central Bank had advertised for artists and designers interested in the commemorative coin process to forward their credentials and examples of their work last January. That process led to the submission of 52 suggested designs which were reduced by a panel to six and finally to the two winners. Mr Guilfoyle had previously designed the € 10 silver proof coin commemorating Jack B Yeats in 2012, and last year the € 10 coin commemorating the Irish tenor Count John McCormack. Mr Mullins was behind the collector coins celebrating the Ploughman Banknotes in 2009 and those marking the 1928 coin designs of Percy Metcalfe. Cette entrée a été publiée dans Ireland 1916-2016, et marquée avec Central Bank, Irlande 2016, Monnaie, Pâques 1916, le 10 septembre 2015 par irlande2016.